Another unfamiliar ceiling…and another unfamiliar but very welcome occurance: that we may be able to bask in Subaru’s latest victories. He’s alive, the kids are safe and their curses are removed, and neither of the twins are dead, hate him, or want to kill him. This calls for a celebratory steamed sweet potato and some Puck-applause! For course, every silver lining has its cloud, which is this case is Beako’s latest unfortunate news for Subie: he still carries the curse of the mabeasts who nommed him, and that curse will allow them to essentially “eat” him remotely by taking all his mana. He has only half a day. 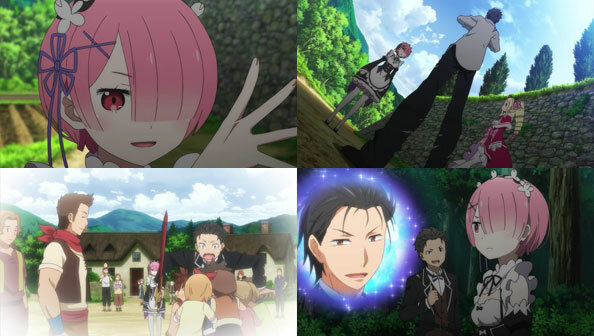 No surprise, then, that Rem has already gone out alone to hunt down the mabeasts who are on the other end of the curse, thus “canceling the meal” and saving Subie, whom she’s become rather fond of, clearly. Going into that forest is not for the faint-hearted, but Subie isn’t letting his Return By Death skill undermine his commitment: he’s going in like he has only one life to live, because he really does only have one life he wants to live, and it’s one where everyone, including Rem, is alive. Joining Subie is Ram, who warns him she’s not the fighter her younger sister is, though she has a pretty nifty Clairvoyance skill, as well as some intimidating wind-elemental magic. 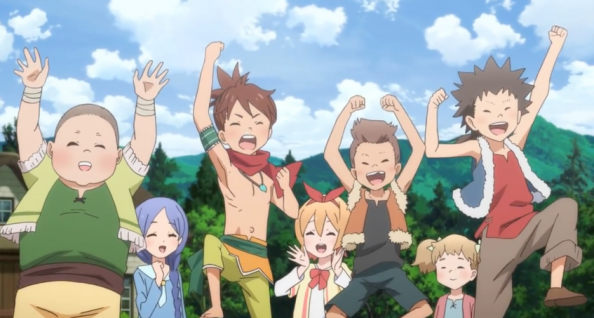 Emilia is too drained from healing Subie, so she’s out, as is Puck, while Subie arms himself with the “sharpest sword in the village”, presented as a gift for his heroism. Notably absent from the party? Beatrice, despite her likely being more than capable of contributing offense. So while imperfect, the Subie/Ram duo gets off to a good start, with Ram showing off the damage her wind magic can do. Then Subie gets a bright idea, using the very curse keeping him from talking to others about Return By Death to lure all mabeasts to his and Ram’s location, luring Rem in turn. For the record, Rem is looking particularly badass and dangerous this week, as her Demon Mode makes her a formidable but also reckless and unstable killing machine. Despite Rem’s initial good intentions (saving Subie), because she’s gotten little carried away by the power of her horn (which Ram lacks), so it also comes as no surprise that after surviving a potentially fatal fall off a cliff, Subie and Ram have to deal with a Rem who isn’t too picky about her targets. 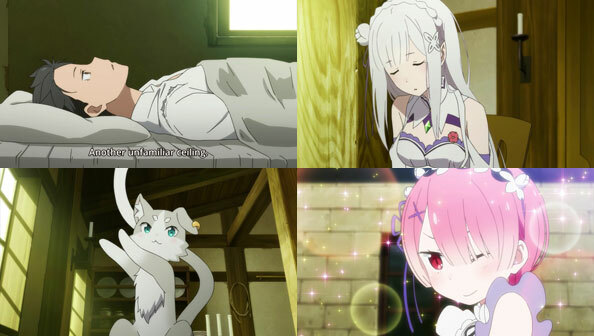 I thought for sure this is how the episode would end: Subie unexpectedly catching a mace to the head and waking back up in the village inn with a sleeping Emilia by his side. It is a new “save point”, after all, and I assumed his Return By Death was only delayed last week so it could occur this week. Mind you, I wasn’t happy about that prospect, which is why I was happy that Re:Zero decided not to kill Subie this week, either. Perhaps it’s aware of the potential for “Reset Button Fatigue”, especially after we only got a grand total of five minutes of victory to bask in. That suspension of Subie’s death wasn’t certain at all, though. 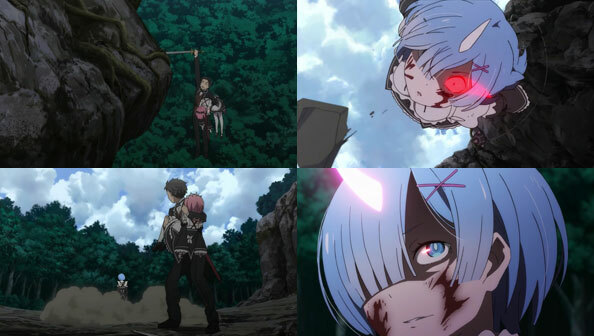 I like how the episode kept me guessing till the end, with a thoroughly berserk and unpredictable Rem flailing that mace around (sorry weapons experts) and Subie seemingly having few options. Of course, I was also amused by the tactic he employs in his effort to cut Rem’s horn and restore her to normal: by tossing Ram straight at her, as a smokescreen for his strike. It almost works on the first try, too…but as Subie said earlier, the “difficulty level” is demonically high, to the point where nothing will work on the first try. 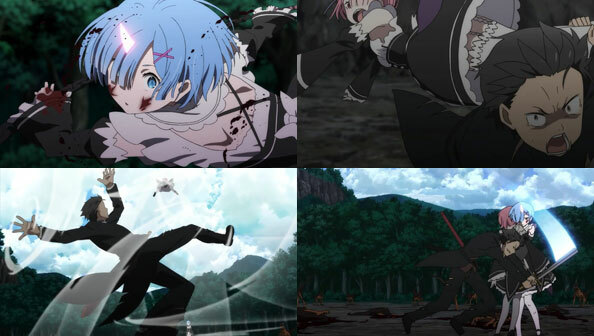 That being said, “Fate-sama” quickly gives Subie a second chance to take out Rem’s horn, and he re-resolves himself not to wuss out at the last second, out of fear of killing either twin. That horn has simply gotta go. I hope he can get it, just like I hope all the mabeasts killed this week mean he’s no longer going to be remotely eaten. 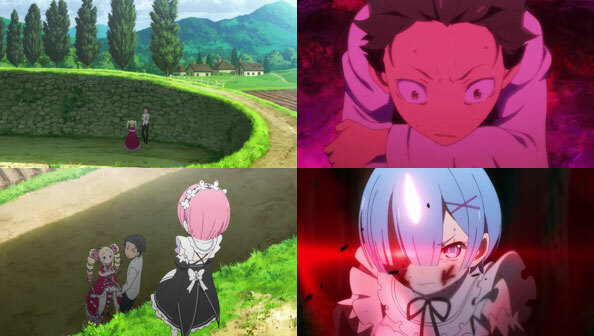 Re:Zero’s action isn’t regularly head-and-shoulders above Kabaneri (despite being better in every other category) but it really distinguished itself this week with some astonishingly cool and exciting animation, made all the more compelling by how much we care about the combatants. Rem truly came off as a force of nature ready to explode. But here’s hoping she doesn’t! Subaru wakes up, in the bed, once again, with the twin maids sitting beside him. This time, he volunteers to work at the mansion once more and spends as much time with them as he can, working his utmost to earn their trust from the start, so they won’t suspect and kill him! His second priority is finding and stopping the shaman who killed him and most recently Rem in previous loops. For the latter part, Subie learns from Puck that he has the somewhat rare “darkness” alignment, rather than any of the standard four elements. Excited to be able to focus his mana through his “gate” and perform magic for the first time in this world (aside from Return By Death, obv) he get’s a little too carried away and blows out all his mana at once. Like Explosion Girl in KonoSuba, this leaves him barely able to move, but he’s absolutely committed to continuing his tireless work with Ram and Rem, knowing his life and future may well depend on the results. Everyone notices that Subaru is simply trying way too hard, hiding his churning troubles beneath an overly chipper, caffeinated exterior. Something has to give, and it does, when he’s overcome by nausea. Emilia is outside the bathroom when he boots, and he can’t fool her any longer, so she takes him up on his desire to lay his head in her lap when the need arises, and it arises. Emilia is so kind and tender and matronly as she gives Subaru something he’s needed for some time: a pressure valve. Safe in her lap, free of complications, he can let it all out, and Emilia is glad to see him not holding it in. In fact, it proves to her that he’s a truly good person, and she relays that to Rem. It’s such a lovely, calming scene, and the episode perfectly built up all that pressure and tension. His Emilia-aided lap pillow catharsis, then, turns out to be the means by which he achieves his first objective: earn the trust of the staff. 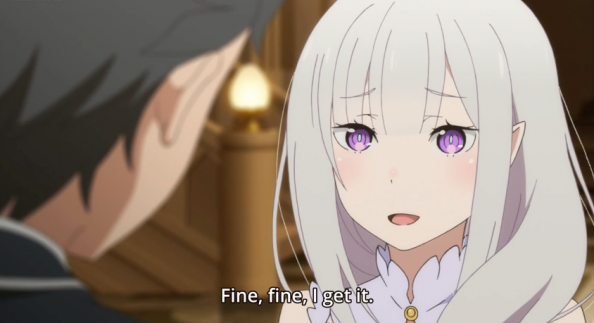 Emilia assures Rem, who tells Ram, who tells Lord Rosvaal. I’d like to think that’s how it works, anyway! That catharsis and its positive effects would not have been possible if Subie had been a mere houseguest and not someone doing his part in the mansion with the maids. He’s done being lazy and half-assing things; that’s how people have died in the past. Of course, there’s still that shaman to contend with. 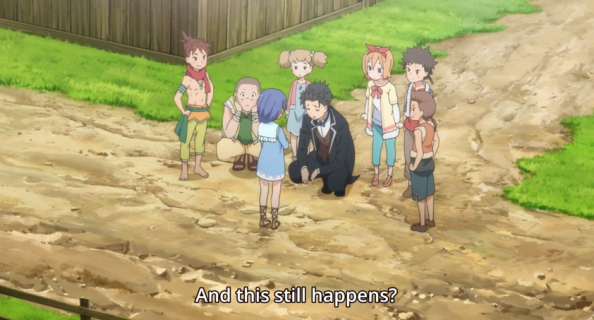 He believes both he and Rem (at different times) were hit by a fatal spell in the village. Now he and both sisters will be going to the village together, and thanks to “Beako”, he knows there’s a way to detect a spell before it’s cast (much like a boss’s big timed attack in RPGS). But once that spell is cast, it can’t be un-cast, so I hope to hell he’s careful and doesn’t have to go through all of this yet again. Another important thing he learned was that people who help him prefer simple thanks to elaborate apologies. Honesty and simplicity are Subie’s tools of salvation. Cry when he has to, accept help without shame, and thank those who give it. If these people see every side of him, not just the artificial ideal, they just might not end up being the “poisonous flowers” he dreads. 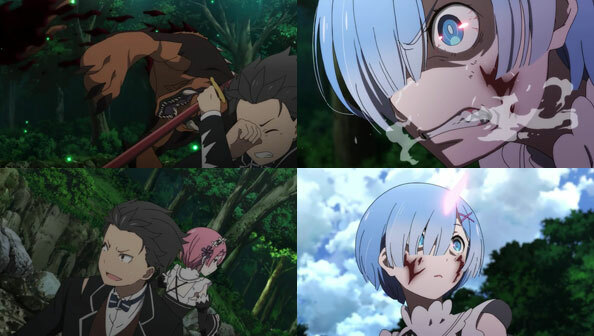 Subaru is able to escape Rem by blinding her with his cameraphone flash, but only temporarily. She slices his leg off, heals it, then starts cutting him up until he’ll talk. She smells the Jealous Witch all over him, and so believes he’s a spy for Emilia’s enemies. She ignores his claims of innocence, and before he can tell her how much he likes her and her sister, she cuts out his throat, and he wakes up once more in that bed. Unsure of what will happen if he dies a fourth time, he tries to switch things up by telling Emilia-tan exactly what’s going on, but before he can get the words out, some vile spectral hand clutches his heart and threatens to burst it. The sad part is, Emilia would have likely believed every word he said, if only he was able to say them. But he can’t, so he has to try something else. When Beatrice visits him in his room to apologize for the first time they met, he asks her to protect him, and she forms a binding contract with him right then and there. He spends the final night before all his previous deaths in the forbidden library with her, and awakes the next morning, elated to be alive and having broken the loop. 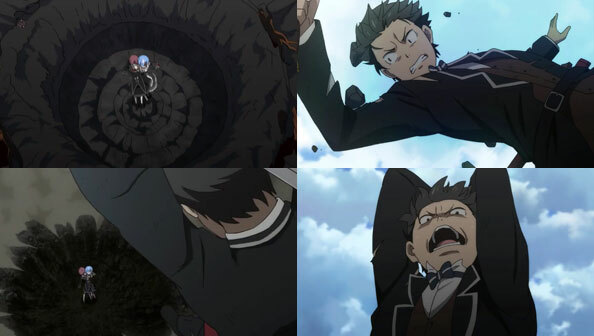 But while the last time he broke the loop, everything turned out fine and dandy, this time Rem seems to die in his place, of the same energy-sapping spell that brought him down the first time he was murdered in the mansion. …But he just can’t. He knows now if he even tries to utter anything at all about his predicament, he’ll be killed by that evil force clutching his heart, literally choked with fear. All he can do is separate himself from the standoff, but running only makes Ram think he’s guilty. All Subaru wants to do is get away. Away from that house, where everything he said and did there was always under the suspicious pall of the twin maids, due to a smell and an influence he didn’t even know existed and still doesn’t understand. He hopes by offing himself voluntarily over a cliff, he can undo all the suffering that he caused, directly or indirectly. Beatrice tracks him down and confirms really what he wants. “What’s lost can’t be reclaimed,” she says. But…with Subie’s ability, can’t what was lost never becomelost to begin with, and thus not need to be reclaimed? And is that not just a roundabout way of reclaiming something, namely a happy future for the inhabitants of the mansion? Subaru agrees there’s nothing he can do here, and as much as he hates it, he must endure the fact that the Emilia, Ram and late Rem of this loop simply can’t remember all the good times they had in other loops. 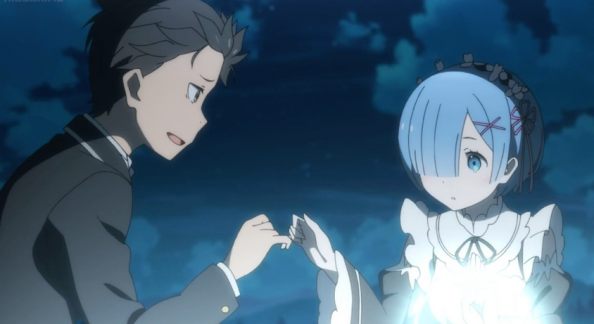 But he does remember, and they’re the same Ram and Rem throughout them all; the Ram and Rem he’s fallen for. Now that he’s saved his own life, he’s going to take it, in hope that resetting of his own free will will enable him to save them. It’s a gamble, but it beats staying where he is. Honestly, this show is so damn good. Breaking up its own pattern by making things worse even when Subaru breaks the loop, and giving him the added problem of not being able to properly explain what’s happening to him. The vice just keeps tightening for our protagonist, and while he hit some emotional lows this week, his old can-do self shined through at the end. I honestly don’t know how he’s going to save Rem and Ram, but I most eagerly await to opportunity to watch.